Congratulations to all those who supported the “Wild and Scenic” designation! We are announcing that seven rivers of the Wood-Pawcatuck Watershed have earned this prestigious designation as part of the National Wild and Scenic Rivers System. Support for this layer of protection and enhancement has been evident from the involvement of local residents, 12 watershed towns, state agencies and congressional delegates of both RI and CT.
WPWA will also kick-off the activities of the Wild and Scenic Stewardship Council later this month. This has been 10 years in the making. 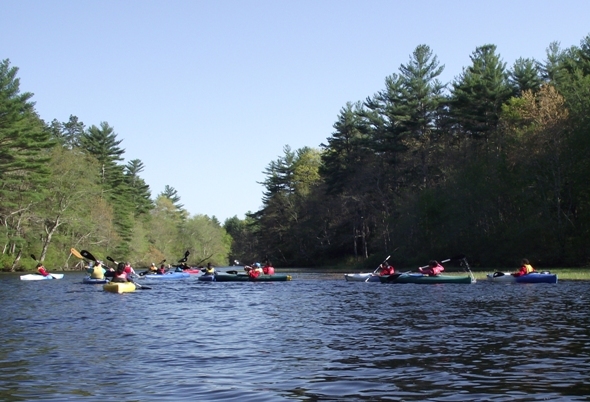 Come celebrate the “Wild and Scenic” designation of the Wood-Pawcatuck Watershed Rivers. Location: Wood River Access in Arcadia Management Area, on Rt. 165 in Exeter, RI. This is an outdoor area adjacent to the Wood River, with parking, bathrooms, and an open air pavilion. The approximate address is 2224 Ten Rod Rd, Exeter, RI 02822 and coordinates are 41° 34.375' N, 71° 43.259' W.
There is a sign on the west side of the road bridge that says “Wood River Access”. Please park on the east side of the river and cross over on the foot bridge. Please RSVP. Register here or contact Kassi.